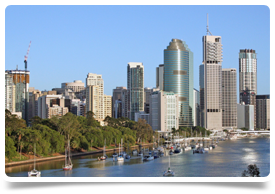 Brisbane – Queensland's Stunning State Capital! 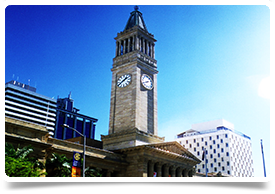 Visitors to Brisbane enjoy the very best in food, wine, arts, entertainment, and sporting events, all surrounded by a unique environment of relaxed sub-tropical flair. There’s exciting shopping, a buzzing night time scene, and a seemingly limitless range of outdoor adventures on offer. You’ll also find this region a hotbed of creative free thinking, with local artists, musicians, writers, jewellers and fashion designers all making their name on the international stage. From the sun- and sand-drenched islands in the east, to the cool and crisp mountain rainforests in the west – and the attractions of a vibrant, modern city in between – Brisbane offers something for everyone. Make a journey to downtown Brisbane and you’ll find a unique combination of the old and the new – sandstone cathedrals blend with steel and glass skyscrapers and modern architectural design is teamed with a healthy respect for tradition. Down at street level a network of grassy parks, shady palm trees and a river that snakes through the heart of town reflects the sub-tropical environment. Spend lazy afternoons ordering cappuccinos and dozing by the river, or step it up a notch by throwing yourself into any number of adventures such as abseiling the cliffs at Kangaroo Point, climbing the bridge or splashing out with all kinds of water sports. There’s also no better place in Queensland to indulge in retail therapy. Start in Queen Street Mall then stroll along to the chic shopping strips and arcades before heading to bohemian precinct, The Valley, where you’ll find the edgiest designs, jewellery and fashions. And finally, why not dig your way through downtown’s weekend outdoor markets, where you never know what you might find. A full calendar of theatre, opera, ballet, musicals and concerts complements an exciting program of exhibitions, installations and cultural attractions. The cultural hub of Brisbane is the South Bank on the Brisbane River, home to some of the nations leading art institutions. Make sure you visit the Queensland Museum & Sciencentre (not a typo! ), State Library of Queensland, the Queensland Art Gallery and the Gallery of Modern Art – the largest modern art museum in Australia. At night, visit one of Queensland Performing Arts Centre’s (QPAC) four venues, and catch a show by the Queensland Theatre Company, Queensland Ballet, Queensland Orchestra or Opera Queensland. Alternatively you could head to the Brisbane Powerhouse Centre for the Arts, home to a progressive program of international and local contemporary arts. For those who love nightlife, Brisbane’s superb selection of venues will keep you more than entertained. Cool, sophisticated bars are sprinkled right throughout downtown Brisbane, as are energetic pubs, nightclubs and intimate live music venues. Brisbane has a fine reputation for dining out, having developed its own unique cuisine that matches the climate perfectly. With its own particular style, influenced by the unique fresh produce of a subtropical climate, dining out in Brisbane is a delight. 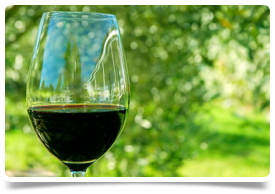 The atmosphere is al fresco and easy going. There’s plenty of variety, as the cosmopolitan mixture of European and Asian cultures throughout the city has resulted in a highly diverse dining scene. At the heart of Brisbane’s cuisine are Moreton Bay bugs (seafood), a must for any visitor. In the city you’ll find cafes, fast and fun noodle bars, wine bars and outstanding delis. By the river Eagle Street Pier is brimming with eateries, and the views are unbeatable. In Brisbane’s Chinatown there’s a vast choice of restaurants and cafes featuring Chinese, Korean, Vietnamese and Malaysian cuisines. Down by the bay, Manly Harbour Village and other beach suburbs are an ideal destination for discovering the fresh seafood wonders of Moreton Bay. Enjoyed by locals and visitors alike, Brisbane’s coastal villages are great for relaxing. Cleveland features an elegant marina with a cosmopolitan feel, or for a more relaxed approach families will love the beautiful foreshore areas for picnics or barbecues and its many playgrounds to keep children happy. Redcliffe Jetty is a top spot when it comes to fishing or for those a little more adventurous, Redcliffe also offers beach sky-diving, and scenic flights. Wellington Point has also become a hotspot for water pursuits such as jetskiing, windsurfing, and the spectacular sport of kitesurfing. Many of the coastal villages have a rich cultural history with heritage trails, art galleries and events. Check out the Cleveland Markets held every Sunday on Bloomfield Street, featuring local arts and crafts. Art lovers should also visit Redland Art Gallery. 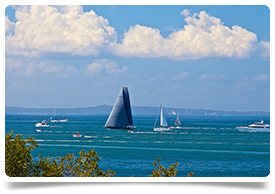 Annual events including ‘Kitefest’ in Clontarf, hosted every May attracts participants from across Australia and the iconic community event, The Redcliffe Festival of Sails held at Suttons Beach celebrates the start of the Brisbane to Gladstone Yacht Race on Good Friday.